In less than two weeks’ time, the winners from the 2018 calendar year will arrive on Maui for the champions-only event. So, Sentry Tournament of Champions officials have unveiled an impressive lineup of local Maui eats and fun new additions to the fan experience for spectators when the tournament returns to The Plantation Course at Kapalua from January 2-6, 2019. The Entry Experience located near No. 2 Green features upgrades for fans as they enter the tournament. Starting with a newly paved entryway, fans will feel welcomed as they walk through the gate at The Plantation Course at Kapalua. As fans know, the Sentry Tournament of Champions takes its food options seriously, and a big part of that in 2019 is the addition of food trucks, including Paniolo and Mr. Taco in the Entry Experience. For some special treats this year, try “Bubba’s BBQ Ribs” at Paniolo named after Bubba Watson and the “DeCham-Burrito” at Mr. Taco named after four-time winner in 2018, Bryson DeChambeau. Another feature in the Entry Experience is the Sentry Swing Simulator. The Sentry Swing Simulator will be a tented structure featuring a two-bay golf simulator, where fans can play SentryWorld – Wisconsin’s first destination golf course – and try their skill on the iconic #16 Flower Hole – a par 3 featuring more than 33,000 flowers surrounding its green. Located near the 18th Green, the Fan Zone is another great place for fans to grab a bite to eat and take in the action on the course. The 18th Green Fan Zone features food trucks Hooked and Big Wave Shave Ice. Eat your lunch like a champion with a special offering at the tournament this year from Hooked: “DJ’s Big Kahuna Tuna Bowl,” named after defending champion Dustin Johnson and be sure to cool down with a traditional Hawaiian shave ice at Big Wave Shave Ice. For those fans of age, the GREY GOOSE 19th Hole is the spot and will be serving the tournament’s signature cocktail, Mea Lanakila (“Champion” in Hawaiian). The Mea Lanakila cocktail will also be sold in conjunction with tournament-branded Corkcicle cups for the first time, a great souvenir for fans to take home. Aloha Friday is a weekly occurrence for the Maui community, and fans are encouraged to participate in the location tradition on Friday of tournament week (Jan. 4) by sporting Aloha wear and Hawaiian-patterned clothing. Fans who participate will have a chance to win prizes via Sentry Tournament of Champions social media channels throughout the day. Fans taking part in this new tournament tradition will be joining players, staff and volunteers as they welcome in the weekend. For fans attending the tournament, free parking is located at the Lāhainā Civic Center (1840 Honoapi‘ilani Highway) with free shuttles to The Plantation Course at Kapalua. 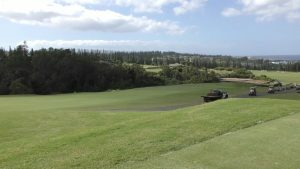 The Sentry Tournament of Champions has also partnered with UBER for fans looking for a safe and extremely convenient transportation method to The Plantation Course at Kapalua this year. Tickets are available here . Fans are reminded each year that up to three children ages 18 and under are admitted free of charge to the tournament with every paid adult (applies to grounds access only). The 2019 Sentry Tournament of Champions returns to The Plantation Course at Kapalua January 2-6. All four competitive rounds will be broadcast on Golf Channel. Fans are encouraged to follow the tournament on Facebook, Twitter and Instagram to get updates and a behind-the-scenes look at the tournament preparations. You can also learn more in our video, What’s New at the Sentry Tournament of Champions .